You’ve been seeing them around town since last July. These free-floating bike share programs have been helping people get around the city, blocking sidewalks, and just about everything else in between. 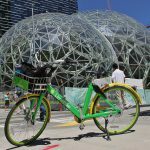 The city is asking Seattleites to take a survey on bike sharing. Green Lake Residential Urban Village: A Transit Void?